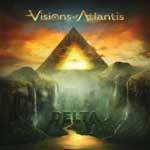 Visions of Atlantis returns with their appropriately titled album Delta (the fourth letter of the Greek alphabet). VoA continues their successful venture into melodic and symphonic power metal, well established since 2004's Cast Away and made complete with 2007's Trinity. Unfortunately, another thing has not changed: the position of female vocalist has continued to be a revolving door. This time it's Greek vocalist Maxi Nil, and she's continues the fine heritage. Otherwise, I'm not sure how much there is to say about this new Visions of Atlantis album. The path they tread is constant. Certainly, things could be said to be heavier, especially listening to Twist of Fate or Elegy of Existence. Yet, all this is tempered with symphonic grandeur. Also, on the male vocal side, Mario Plank seems to pursue a rougher side. This makes me wonder of VoA is hoping to capitalize on whole 'female versus male death metal vocal' motif in the future. If so, I would lose my interest: it's simply to cliche. Nevertheless, VoA can still inspire. While Ms. Nil seems to be getting either left behind by the music or beat up by the male vocals, she shines on Reflection, a beautiful piece which combines majesty with power. Also, Black River Delta and Conquest of Others deliver on a level only the most seasoned peers could expect. Vision of Atlantis's Delta is pure European melodic and symphonic power metal in its best form. The band is adept at blending the male/female vocal contrast to efficient and entertaining effect over some quite bombastic arrangements. While hardly novel, Delta is consistent, strong, and quite entertaining Visions of Atlantis. I would expect no less. Recommended. Vision of Atlantis's Delta is pure European melodic and symphonic power metal in its best form. The band is adept at blending the male/female vocal contrast to efficient and entertaining effect over some quite bombastic arrangements. While hardly novel, Delta is consistent, strong, and quite entertaining Visions of Atlantis. I would expect no less.